Extraspace Solutions specialises in meeting the challenging demands of modern construction, especially when space is at a premium, by offering versatile, cost-effective and highly practical modular systems. 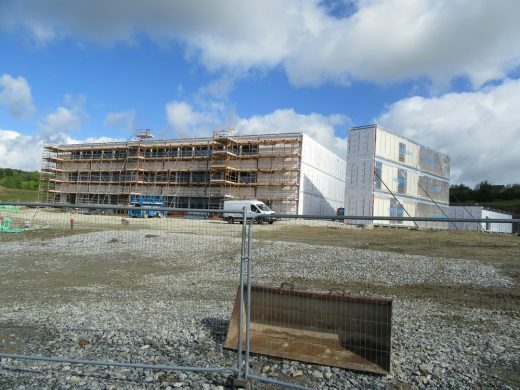 One innovative new project is a 20 million Euro office development for Pramerica Systems Ireland Ltd in Letterkenny, County Donegal, Ireland that consists of 300 hi-tech modules – with the potential to increase this number incrementally to 420 as the business continues to grow. Pramerica Systems Ireland is a technology and shared services subsidiary of U.S.-based Prudential Financial, Inc. Pramerica employs over 1300 people in Letterkenny, providing a range of essential computer-technology and client-contact services to Prudential’s global operations. There are three separate three-storey blocks, each with a footprint of 51m x 24m and each steel-frame module measures 12.2m long x 2.9m wide. Designed to achieve specifications above and beyond building regulations, each unit aims for maximum efficiency and benefits from the proven performance of DuPont building membranes. 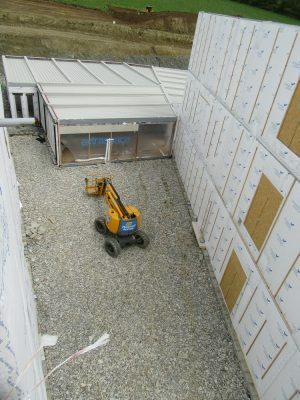 The advanced breather membrane Tyvek® Soft is used as the external weather proofing shield (and has been specially branded with the Extraspace Solutions logo, which remains visible during the build process) while the high-performance air and vapour control layer DuPont™ AirGuard® Reflective enhances the airtightness of the structure. 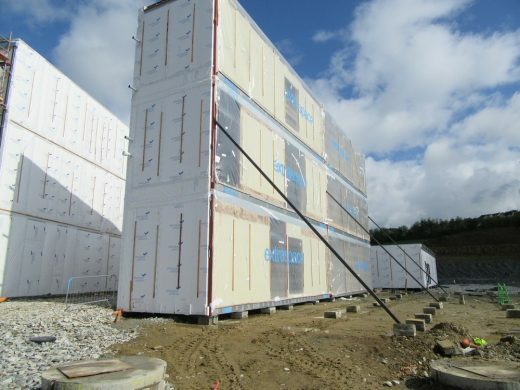 Capitalising on the advantages of off-site construction methods, the modules are delivered to site already wrapped in these robust yet lightweight membranes and the envelope is then fully sealed using DuPont tapes and accessories, especially where any apertures and penetrations may have been made. This solution creates a reliable water shedding external layer in the form of the unique and enduring properties of DuPont™ Tyvek®, which also allow water vapour to escape naturally to the atmosphere. 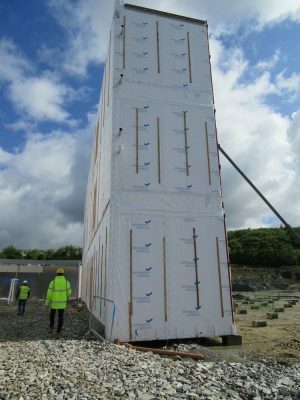 Once on site the modules are then externally clad with a rendered system and core insulation is added to the interior, safe in the knowledge that it will be protected for the long term and its performance enhanced by the market-leading membrane. The interior facing walls of the pods are then sealed with DuPont™ AirGuard® Reflective, an innovative metallised AVCL which offers 100% airtightness and low emissivity, to enhance both thermal efficiency and interior comfort. 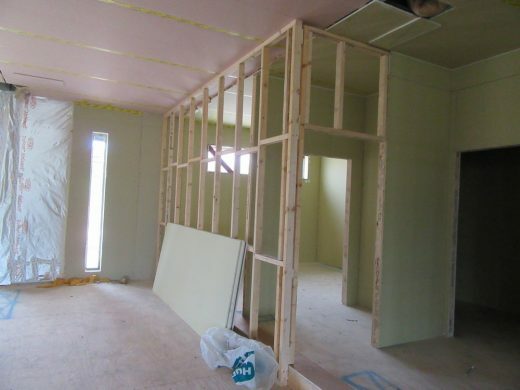 Extraspace Solutions are aiming to achieve an airtightness value of for the project and DuPont™ AirGuard® was chosen, according to Stevin Tedstone of Extraspace “For its overall performance as well as being the only reflective AVCL with both a warranty and a BBA certificate. DuPont™ Tyvek® is distinctive in many vital ways from its hi-tech naturally breathable composition, to its renowned long term functionality. Both DuPont™ AirGuard® and DuPont™ Tyvek® also come with expert technical guidance and with the added peace of mind of a comprehensive range of certification and building regulation compliance. About DuPont™ Tyvek® Invented in the DuPont research and development laboratories, the DuPont™ Tyvek® family of advanced building membranes are distinctive in several key ways that make them ideal for today’s construction projects. All the crucial requirements for a high-performance breather membrane are embodied in DuPont™ Tyvek® which is unique in the market because of its high-quality single layer construction. DuPont™ Tyvek® is naturally vapour open but also wind and water-tight due to its composition of millions of micro fibres bonded together to make a “maze” that’s impermeable to air and moisture but allows water vapour to pass through its natural pores. Lightweight yet robust, DuPont™ Tyvek® is easy to install to exterior walls and roofs and offers long term proven reliability and durability. 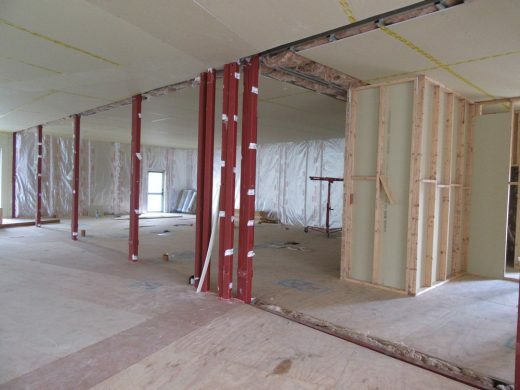 Designed to protect the building envelope against the effects of weather and moisture, the membranes also offer optimal air-tightness and can help to improve the thermal performance, energy-efficiency and interior climatic stability and comfort of a building.